Kareem Abdul Jabbar and Donald Trump are shown in file photos. LOS ANGELES -- Donald Trump is tangled in a war of words with Kareem Abdul-Jabbar over an op-ed essay penned by the former Laker great. The NBA's all-time leading scorer criticized Trump on Wednesday in an essay for the Washington Post. 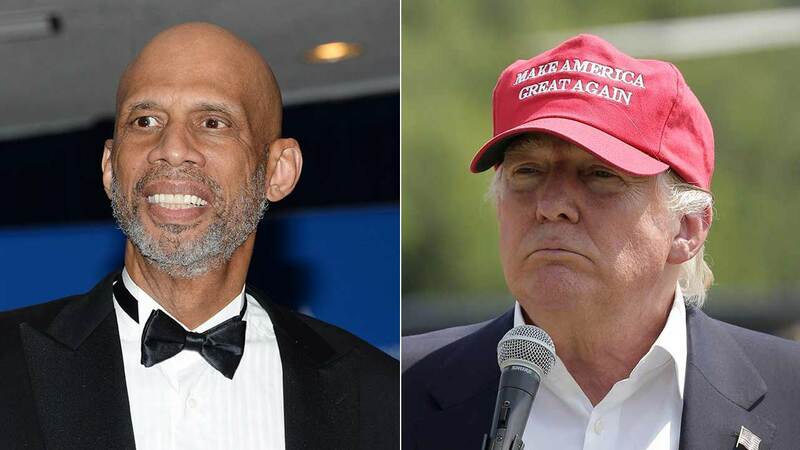 Abdul-Jabbar slammed Trump for leaving the campaign littered with offensive remarks. He cited Trump's comments toward Fox anchor Megyn Kelly and his clash with Univision reporter Jorge Ramos as prime examples of the businessman's bullying tactics. "Now I know why the press always treated you so badly - they couldn't stand you. The fact is you don't have a clue about life and what has to be done to make America great again," Trump wrote, signing the letter, "best wishes." 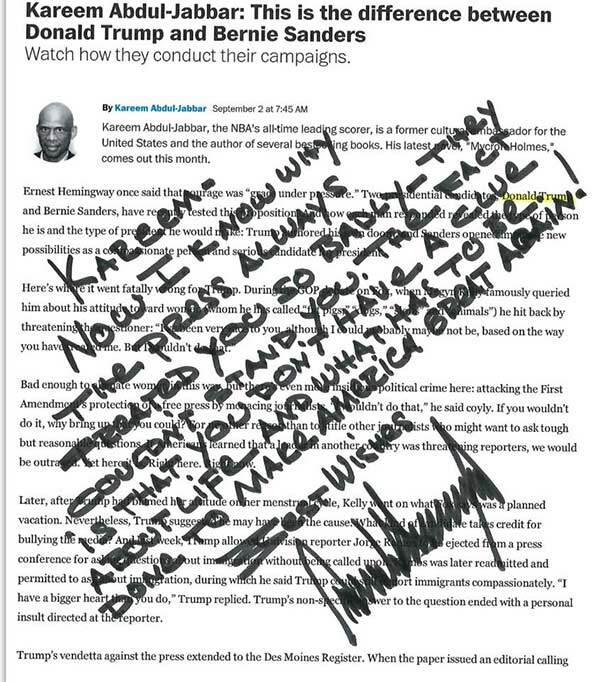 Donald Trump sent this handwritten note to Kareem Abdul Jabbar after the former Laker great penned an op-ed about the businessman in the Washington Post. Abdul-Jabbar's thoughts on Trump's response? He said it just serves to validate the points he made in his essay. "Trump's response to my piece is the best, though inelegant, support for my claims. Here again, he attacks a journalist who disagrees with him, not by disputing the points made but by hurling schoolyard insults such as, 'nobody likes you,'" Abdul-Jabbar wrote in a follow-up piece for the Washington Post.